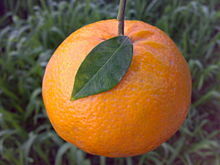 The 'Kinnow' is a high yield mandarin hybrid cultivated extensively in the wider Punjab region of Pakistan and India . In a hot climate, plants can grow up to 35 feet high. 'Kinnow' trees are highly productive; it is not uncommon to find 1000 fruits per tree. The fruit matures in January or February. It peels easily and has a high juice content. The high seed content in this variety is a major hindrance in out-of-hand eating. Mikeal Roose  of University of California, Riverside, USA developed low seeded 'Kinnow' and this variety was released under the name ' Kinnow LS' in the year 2011. H.S.Rattanpal  of Punjab Agricultural University, Ludhiana, India developed low seeded 'Kinnow' through mutation breeding and recommended it under the name ' PAU Kinnow-1' in the year 2015. In Pakistan, a seedless 'Kinnow' has been developed (using selection method) by Niaz Ahmad Chaudhry '  ', a team member of National Agricultural Research Centre (NARC), Islamabad ' NARC' (former director of Citrus Research Institute (CRI), Sargodha,' CRI'. ^ Y. H. Hui, M. Pilar Cano, and Josef Barta (Editors) Handbook of Fruits and Fruit Processing. Wiley, John & Sons. 2006. ISBN 978-0-8138-1981-5; page 312. ^ "newitworld.com". newitworld.com. Archived from the original on 2015-02-04. ^ "UCR Newsroom: UC Riverside releases new citrus variety: 'KinnowLS'". newsroom.ucr.edu. Retrieved 2017-05-19. ^ "Cross pollination: PAU low seeded kinnow scores over Pak variety". The Indian Express. 2015-04-02. Retrieved 2017-05-19. ^ "Indonesia, Pakistan ink trade agreement". Investvine.com. 2013-02-17. Retrieved 2013-02-21. ^ "Kinnow demand: Over 40% of exports go to Russian market". The Express Tribune. ^ a b "Citrus cultivation in Punjab" (PDF). Punjab Agricultural University, Ludhiana, India.